This scoping review considered the role of chaplains with regard to ‘moral injury’. Moral injury is gaining increasing notoriety. This is due to greater recognition that trauma (in its various forms) can cause much deeper inflictions and afflictions than just physiological or psychological harm, for there may also be wounds affecting the ‘soul’ that are far more difficult to heal—if at all. 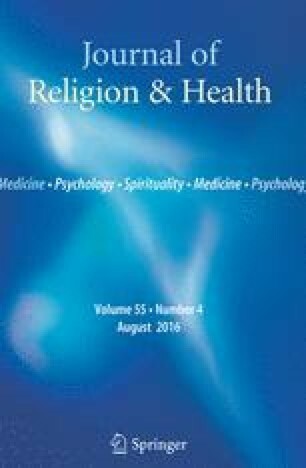 As part of a larger research program exploring moral injury, a scoping review of literature and other resources was implemented utilising Arksey and O’Malley’s scoping method (Int J Soc Res Methodol 8(1):19–32, 2005) to focus upon moral injury, spirituality (including religion) and chaplaincy. Of the total number of articles and/or resources noting the term ‘moral injury’ in relation to spiritual/religious issues (n = 482), the results revealed 60 resources that specifically noted moral injury and chaplains (or other similar bestowed title). The majority of these resources were clearly positive about the role (or the potential role) of chaplains with regard to mental health issues and/or moral injury. The World Health Organization International Classification of Diseases: Australian Modification of Health Interventions to the International Statistical Classification of Diseases and related Health problems (10th revision, vol 3—WHO ICD-10-AM, Geneva, 2002), was utilised as a coding framework to classify and identify distinct chaplaincy roles and interventions with regard to assisting people with moral injury. Several recommendations are made concerning moral injury and chaplaincy, most particularly the need for greater research to be conducted. The authors wish to thank Dr. Neil Pembroke and Dr. David Pitman (School of Historical and Philosophical Inquiry, University of Queensland, Brisbane), Dr. Bruce Rumbold, OAM (Palliative Care Unit, La Trobe University, Melbourne) and Chaplain Mark Willis (ADF Joint Health Command, Canberra) for their support of this research. The lead author regularly contributes to chaplaincy services and research within Australia and New Zealand. Ethics approval was granted by the University of Queensland Human Research Ethics Committee. This research did not directly involve any human or other animal participants as research subjects. H = Hope—Sources of strength, meaning, love? O = Organised—Role of organised religion? P = Personal—Personal spirituality and practices? E = Effects—Effects of spirituality/beliefs? AFAN. (2016). All faiths and none: Website for AFAN Inter-Faith/Belief Programme. AFAN registered charity (No. 1137477), UK: http://www.afan.uk.net/. Berg, G. E. (Producer). (1992). Living Water Computer Spiritual Assessment Program. Maple Grove: Minnesota Living Water Software Corporation. Retrieved from http://www.spiritualassessment.com/Home_Page.html. Berg, G. E. (Producer). (2016). Spiritual Assessment Manual. Maple Grove: Minnesota: Living Water Software Corporation. Retrieved from http://www.spiritualassessment.com/Home_Page.html. Breitbarth, A., & Entrekin, J. (2013). Bringing solider ‘back into the light’. Retrieved from http://www.army.mil/article/113233/Bringing_Soldiers__Back_Into_the_Light_/. Brock, R. N. (2011). How do we repair the souls of those returning from Iraq? [Blog post]. Retrieved from http://www.huffingtonpost.com/rita-nakashima-brock-ph-d/the-war-is-coming-home-so_b_1027499.html. Brock, R. N. (2014a). Soul repair from moral injury after war [video file]. Retrieved from http://vimeo.com/89751497. Brock, R. N. (2014b). Understanding moral injury [Video file]. Retrieved from https://www.youtube.com/watch?v=B91Ce4AzyAM. Dyer, T. (2012). Repair of moral injury. Paper presented at the Southern Queensland Chaplains Seminar Enoggera Barracks, Enoggera. http://johnmark.net.au/jm/?p=920. FADTRC. (2016). Mental health of Australian Defence Force members and veterans. Retrieved from Canberra: Foreign Affairs, Defence and Trade References Committee (FADTRC), The Senate - Commonwealth Government of Australia: http://www.aph.gov.au/senate_fadt. Frame, T. (2016). Presentation to the Senate Public Hearing—Mental health of ADF serving personnel. Retrieved from Australian Government Parliament House, Canberra: Foreign Affairs, Defence and Trade Reference Committee, http://www.aph.gov.au/senate_fadt. Keizer, H. (Producer). (2010a). Truth commission on conscience in war (Part 1) [Video file]. New York City: The Riverside Church. Retrieved from https://www.youtube.com/watch?v=mCAHWCwmDyM. Keizer, H. (Producer). (2010b). Truth commission on conscience in war (Part 2) [video file]. New York City: The Riverside Church. Retrieved from https://www.youtube.com/watch?v=yjH9UsBma1Q. Kopacz, M. S., Nieuwsma, J. A., Jackson, G. L., Rhodes, J. E., Cantrell, W. C., Bates, M. J., & Meador, K. G. (2015b). Chaplains’ engagement with suicidality among their service users: Findings from the VA/DoD integrated mental health strategy. Suicide and Life-Threatening Behavior, [Online]. doi: 10.1111/sltb.12184. Puniewska, M. (2015). Healing a wounded sense of morality. The Atlantic. The Atlantic Media Group, Washington DC. Retrieved from http://www.theatlantic.com/health/archive/2015/07/healing-a-wounded-sense-of-morality/396770/. Shay, J. (2012). Combat trauma and moral injury. [Audio Podcast, February 12]. Retrieved from http://www.ihc.ucsb.edu/downloads/AUDIO/fallout/Jonathan_Shay.mp3. Townsend, T. (2015a). Chaplains on front lines in struggle to heal ‘moral injuries’. The Washington Post. Retrieved from http://ez.library.latrobe.edu.au/login?url=http://search.proquest.com.ez.library.latrobe.edu.au/docview/1672346543?accountid=12001. Townsend, T. (2015b). Chaplains tending spiritual wounds, Article. The Washington Post. Retrieved from http://search.ebscohost.com/login.aspx?direct=true&db=bwh&AN=wapo.614d9114-de50-11e4-a500-1c5bb1d8ff6a&site=ehost-live&scope=site. Whish-Wilson, P. S. (2016). Mental health of Australian Defence Force members and veterans - Additional comments from the Australian Greens. Retrieved from Canberra: Foreign Affairs, Defence and Trade References Committee (FADTRC), The Senate - Commonwealth Government of Australia: http://www.aph.gov.au/senate_fadt.